Preparatory work is under way Saturday ahead of demolishing a kindergarten building that is precariously tilting in Seoul, authorities said. 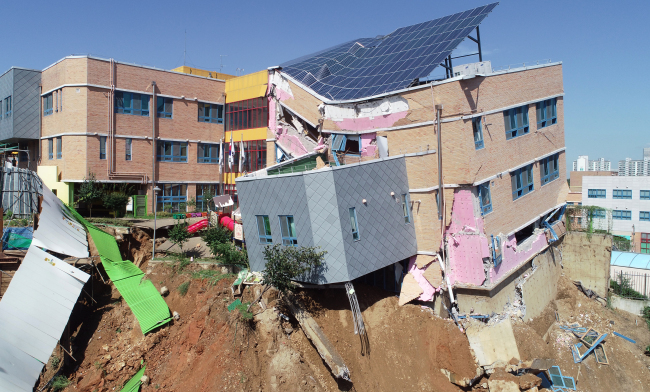 On Thursday night, Sangdo Public Kindergarten in the southern district of Dongjak began leaning nearly 20 degrees after a retaining wall in an adjacent construction site collapsed for unknown reasons. No casualties were reported, as the three-story building was empty at the time. Some 120 preschoolers attend there. "We are now filling up the subsided ground under the kindergarten, which is necessary to tear down the building safely with heavy equipment. After that, we will begin demolishing it on Sunday," an official at the ward office said. "The damaged part of the building will be removed, and then we will conduct a safety check into the remainder to see if it can be used or not," he added. The incident has caused a public uproar over the insensitiveness to safety. As there were warning signs, such as major cracks in floors, school officials, the construction company and the district office held a meeting the day before the collapse, which ended up being too late.